When most folks think of Washington, known as The Evergreen State, they visualize thick forests and snow-capped mountains. The peninsulas and islands of the state, however, are seemingly in another world. It is here, where the land meets the sea and the US meets Canada, that you will find two unique National Parks sites. In the far northwest corner of Washington is San Juan Island National Historical Park. This site commemorates the peaceful “war” between the US and England over the ownership of the San Juan Islands. 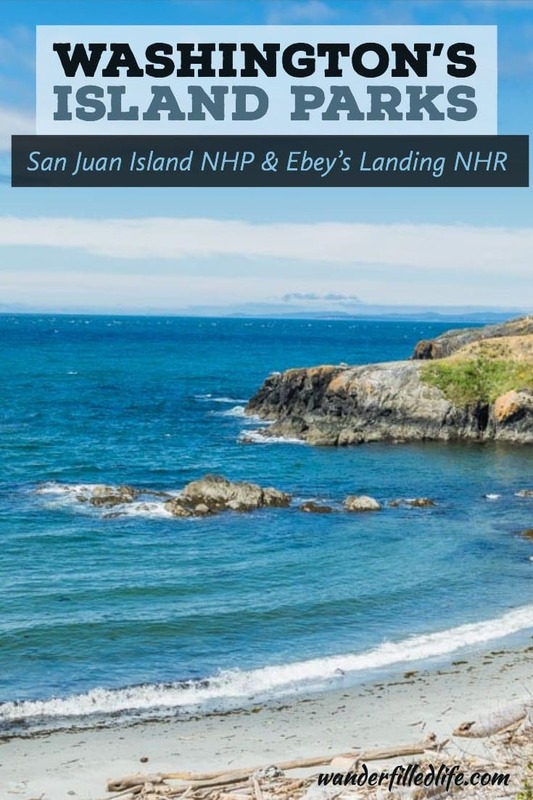 Closer to the mainland, on Whidbey Island, is Ebey’s Landing National Historical Reserve. Here, the National Park Service protects and preserves a rural community as a historical record of the past. 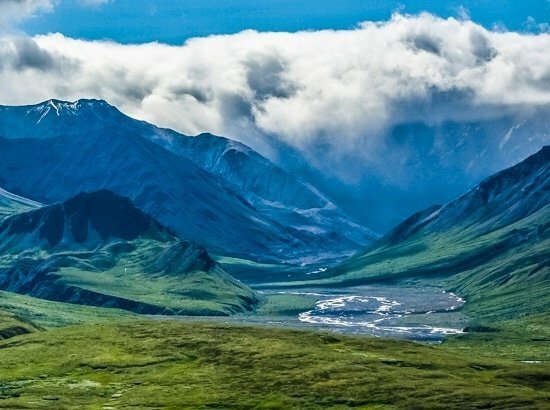 While these sites may not be as big or as popular as Washington’s three national parks, they are scenic and interesting in their own right. Each site offers visitors a glimpse into a piece of history that they might not otherwise be familiar with. The west side of San Juan Island is a great spot for whale watching and you can see the Olympic Mountains in the distance. This ongoing history lesson is just one of the many reasons we love the smaller sites. We seem to learn more and more about our country with each park visit, regardless of how small or obscure the site is. The San Juan Islands are an island group located in the northwest corner of Washington. With an average of 247 days of sunshine each year, the San Juan Islands get about 100 more days of sunshine than Seattle, just 100 miles south. As you might imagine, the islands are a popular weekend and holiday destination. Friday Harbor, the main town on San Juan Island. No bridges connect the San Juan Islands to the mainland. Vehicle access to four of the largest islands, including San Juan Island, is provided by Washington State Ferries. There are a few other ferry systems (some just for pedestrians) that service the smaller islands. Of course, you can also reach the islands by private boat, charter boat or plane. 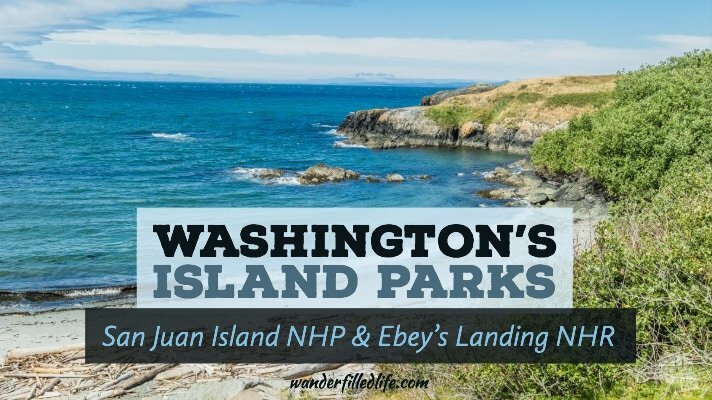 Our visit took us only to San Juan Island, where the National Historical Park is located. Even with only a few hours to tour the island, we certainly understand why folks flock here on the weekends. I think we could easily spend a week or two exploring the island chain and relaxing in the sunshine! We took the popular (and easy) route to San Juan Island, which is the Washington State Ferry. I have to say, our rides on the Washington State Ferries were some of the best ferry rides we’ve had. Approaching Friday Harbor on San Juan Island. Reservations can be made for some ferries. If you are traveling during a peak time (weekends and holidays, in particular) I would definitely suggest making a reservation. It is important to note that a ticket must be purchased independently of a reservation. With or without a reservation, the “line up” lines can get long. 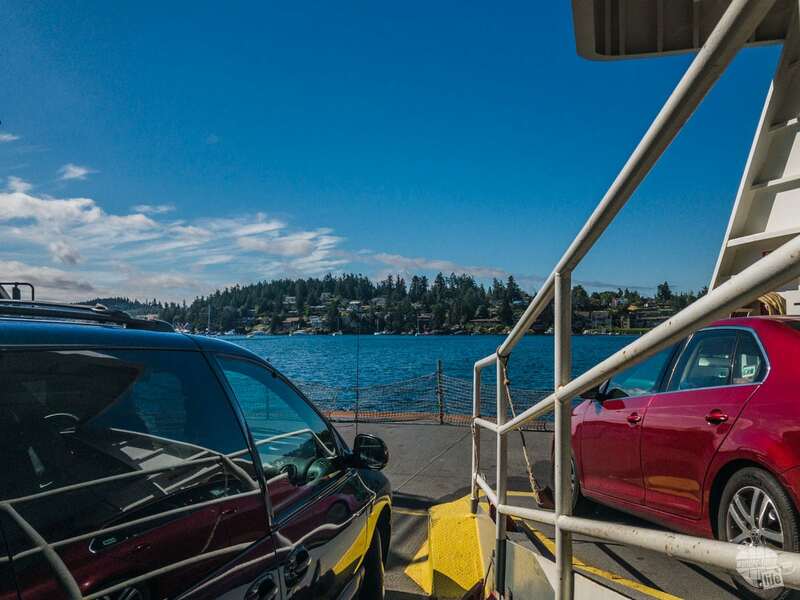 On the ferry, you’ll see every kind of vehicle possible, including cars, trucks, RVs, semis and fuel tankers. Seriously, these ferries are huge and can fit just about anything! And the crew can really pack the vehicles in like Tetris champions! Once you’ve parked, head upstairs for a comfortable ride. The ferries we were on had TONS of seating, inside and out, including some booths with tables – perfect if it’s time to eat or you need to get some work done. You’ll also find a small snack bar with basic food and drinks onboard. Waiting on the ferry, which was running late. One thing to note about the ferries: they sometimes run late, especially later in the day. Our return ferry from San Juan Island was nearly an hour late. Some friends had a similar experience a week or two after us. I have a feeling it’s a thing. Just keep that in mind when planning. For many years, in the early 1800s, the Americans and British enjoyed joint exploration and occupation of the area that is now Vancouver Island and the northwest corner of Washington. As we know, though, joint occupation can’t last forever. In June 1846, the Treaty of Oregon established boundaries for each country. 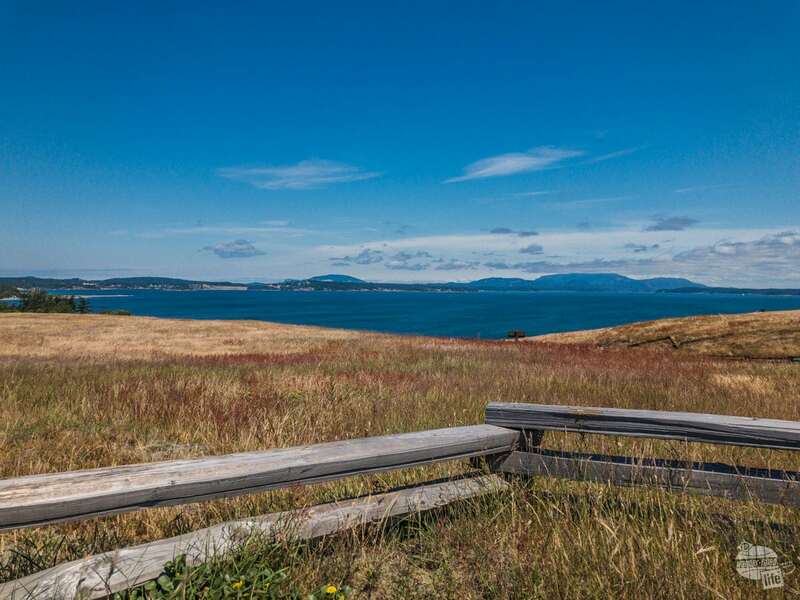 The view at American Camp at San Juan Island National Historical Park. Unfortunately, the lines are drawn only mentioned one channel separating Vancouver Island from the mainland. In fact, there are two channels – one east of the San Juan Islands and one west of the islands. Thus, both sides claimed the entire island group. Once both sides began claiming land rights, the peacefulness slipped away. One night an American shot a pig rooting in his garden. The pig was owned by the British Hudson’s Bay Company. Before long, both sides set up a military encampment on the island. Thankfully, the “war” never escalated, though San Juan Island experienced a peaceful joint military occupation for the next 12 years. Sailboat in Wescott Bay along the Bell Point Trail at English Camp in San Juan Island NHP. Ultimately, Kaiser Wilhelm of Germany ruled in 1871 the islands belonged to the US. Within two years, all military troops had left. Today, San Juan Island is known for this peaceful “war” in which the only casualty was a pig. The national historical park consists of two units, where each side set up their encampment: the American Camp and the English Camp, on opposite ends of the island. 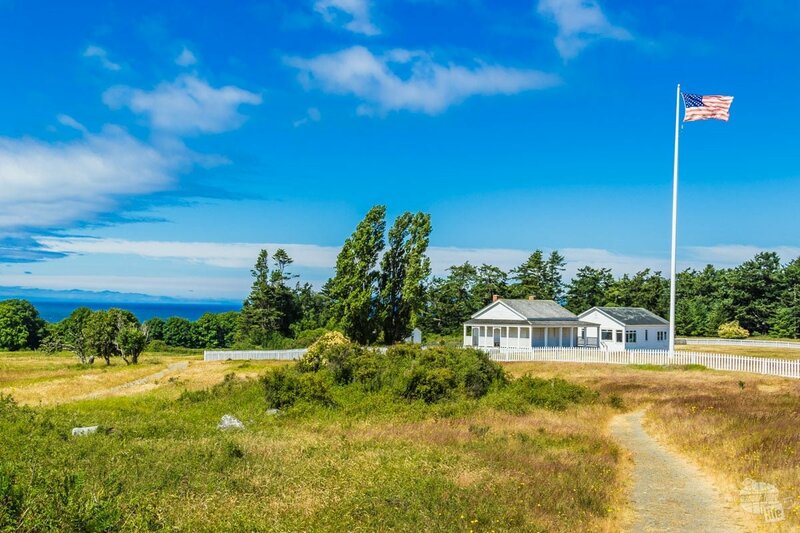 The former American Camp on the southeast side of San Juan Island holds the Park’s main Visitor Center, which is tiny. Be sure to stop and watch the short film. As most park films do, this one provides a good overview of the history behind the park and how the US and British lived together, peacefully, on one fairly small island. A short trail will take you to the remnants of the military camp. Three buildings remain: the laundress quarters and officers’ quarters. A small redoubt still stands a little further out. Another short trail will take you to the coast. The hike down is a bit steep, but doable if you want to walk along the short stretch of beach. Here, at Grandmas Cove, you can search the tide pools if you time your visit right. A short drive further towards the tip of the island will take you to a large open field as you make your way towards South Beach. According to the ranger, there was a fox den in the area. We searched and searched but never saw them. If you are looking for some hiking trails, there are a few on the north side of the peninsula. We did not have a ton of time, so we only walked the trails at the visitor center. Also, note that as you drive to the tip of the peninsula you will leave national park property. Please be mindful of the state park area and private residences. I would allow a couple of hours to visit American Camp. Maybe add a little more time if you want to do more hiking or hanging out on the beach. Located on the northwest side of the island is English Camp on Garrison Bay. From the parking lot, walk downhill to the parade ground, barracks and commissary. A small visitor center is set up in the old barrack’s building but is only open seasonally. A trail winds around the coast and loops back to the parking lot. This 1.5-mile trail is a fairly easy walk through the woods. A few breaks and side trails offer views of the coastline. For a bit more of a workout, you can hike up from the parking lot to Young Hill. This steep 0.6-mile trail gains about 650 feet of elevation. We did not do this trail but heard that views from the top were great. An hour or two is probably enough to see the highlights of English Camp. San Juan Island is fairly small, but there are plenty of things to do. As we were only visiting for the day, our focus was the national historical park and driving around. Visitors staying overnight or for several days should easily be able to stay occupied, though. 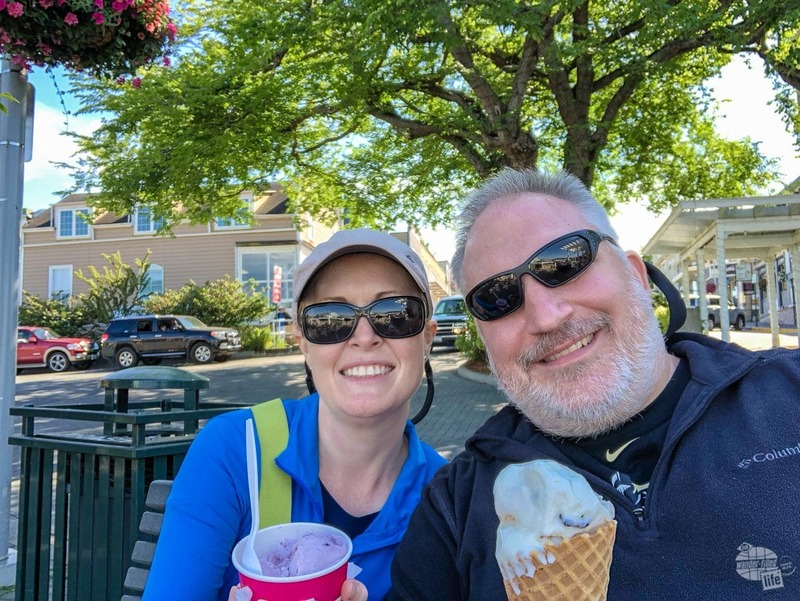 Stopping for some ice cream in Friday Harbor. 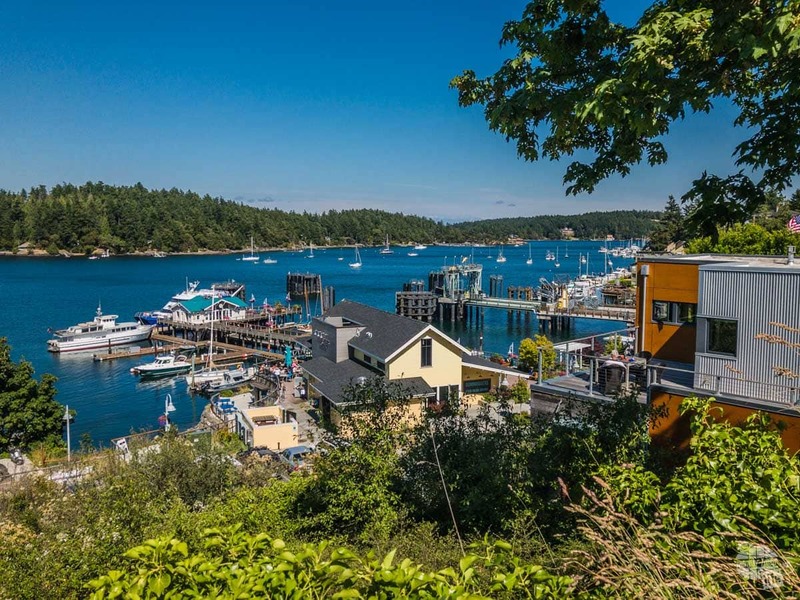 San Juan Island is small, so there is only one town: Friday Harbor. This is where you will find the ferry and the vast majority of all the services on the island. Depending on how much you like to shop (or at least window shop), you could spend an hour or two wandering the streets of downtown and checking out the various restaurants and stores. Grant trying out samples of the wares at the House of Jerky. Grant’s favorite store was the House of Jerky. 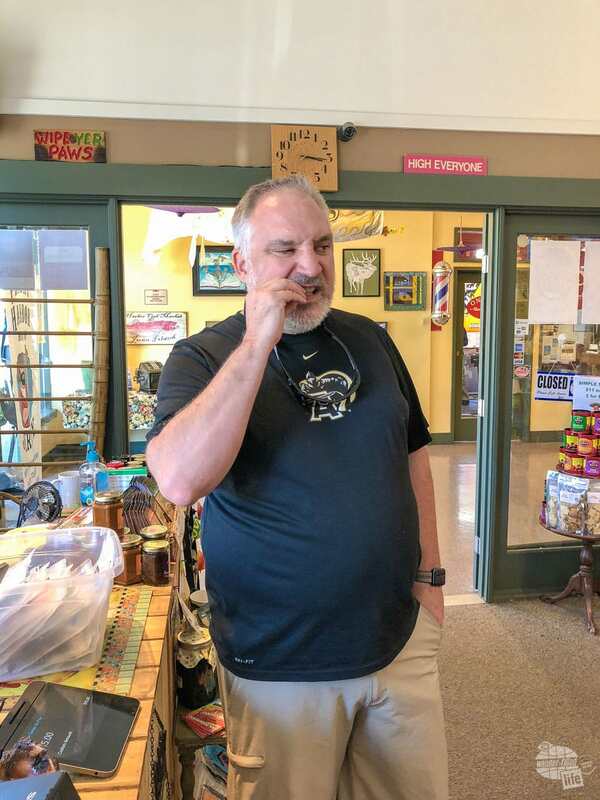 Here, he was able to sample MANY different varieties of jerky, including boar, elk, rabbit and kangaroo. Somehow we managed to get out without buying the entire store, but Grant did pick up a few snacks for the drive back home! The grocery store is fabulous and can easily provide snacks, a meal or all the groceries you need for an extended visit. We were really impressed by the selection, especially on a fairly small island. The prepared food was especially nice since there really aren’t any fast food options on the island. 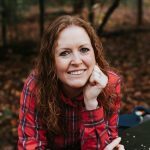 If you are going to be out and about exploring most of the day, I would certainly stop by and grab lunch, or at least some snacks, so you don’t have to come back to town for food. 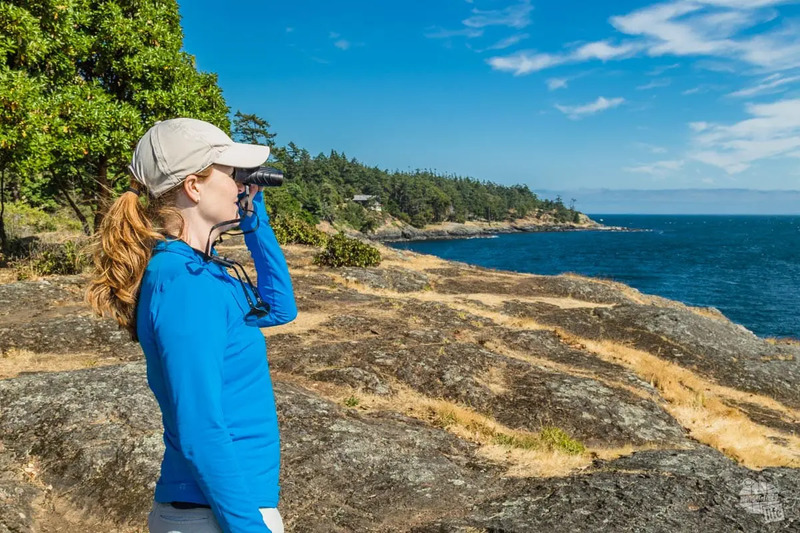 Known as the place for whale watching on San Juan Island, Lime Kiln Point State Park is often called Whale Watch Park. Because we were short on time, we did not actually enter the park, but we did drive by and pull into a nearby roadside pull off. Sure enough, just driving by we saw a couple of orcas! Bonnie scanning for whales along the west coast of San Juan Island. If you have the time, I would definitely suggest spending some time in or near the state park to look for whales, picnic, hike or explore the lighthouse. The majority of our one day visit was spent at San Juan Island NHP, driving around the island and wandering around downtown. We had lunch at Friday’s Crabhouse, which was ok, but nothing special. Sitting outside and enjoying the fresh air was nice, though! If you have more time, some other places of interest are a lavender farm, an alpaca farm, a sculpture park, a vineyard, a distillery and a brewery. I really do wish that we had more time to explore and enjoy some of these unique offerings! 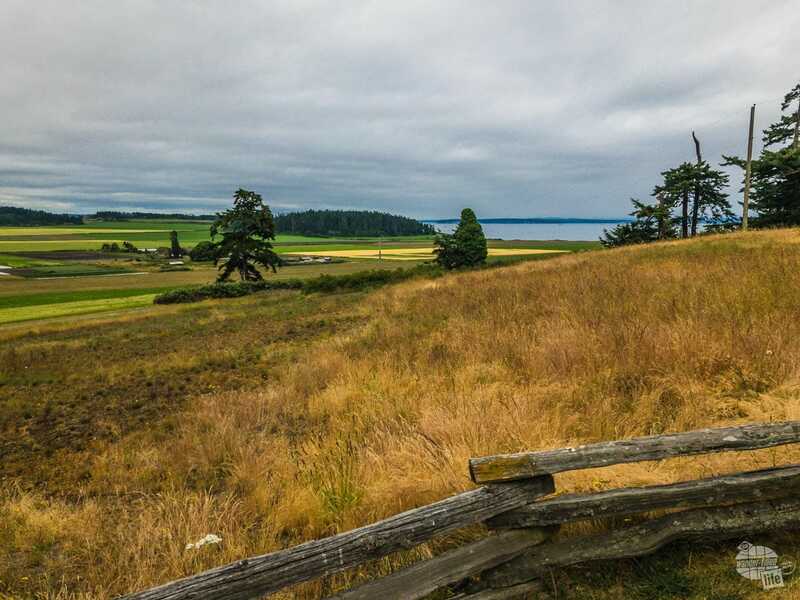 Ebey’s Landing National Historical Reserve is centrally located on Whidbey Island. This island can be accessed by road from the mainland on the north end and by ferry on the south end. Not wanting to wait for a ferry and deal with the hassle, we drove to the island but ended up taking the ferry back. A small lighthouse in a cove in Coupeville on Whidbey Island. Which one is better really just depends on your timing. The ferry crossing is only about 20 minutes, but the drive around would be nearly two hours. The ferry was faster for us because we somehow arrived within just a few minutes of the start of boarding and managed to get on. 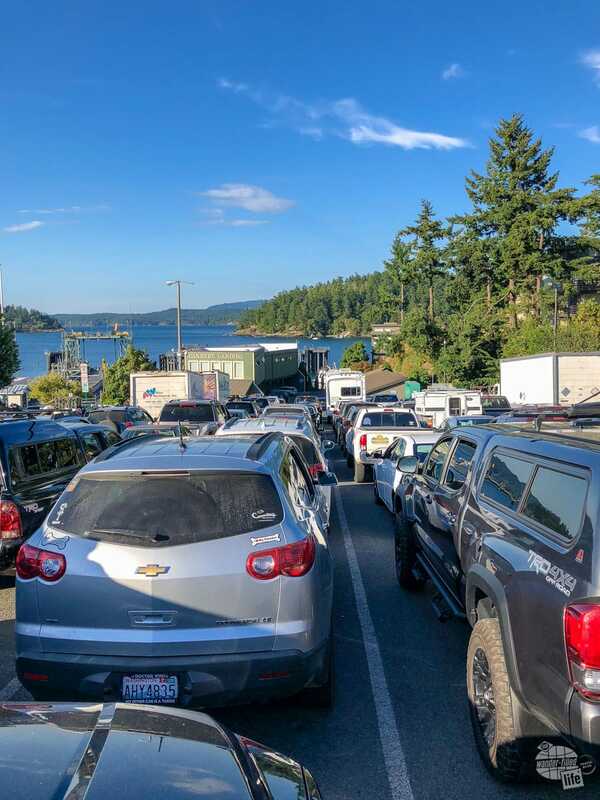 If you’re traveling at a peak time, you could end up waiting an hour or two just to get on the ferry. 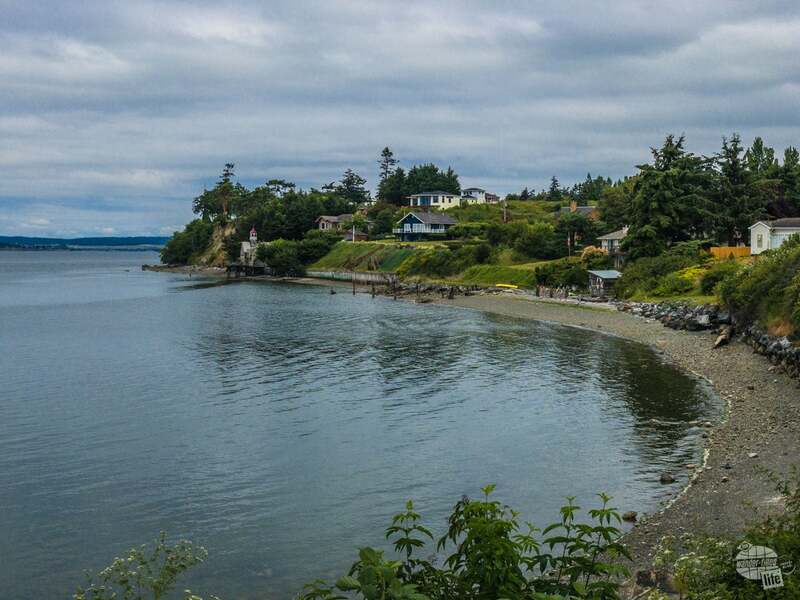 In addition to the national historical reserve, Whidbey Island is home to quite a few state parks and other points of interest. We only had time for the Reserve, but you could certainly spend more time exploring the small towns, beaches, farms, gardens and other attractions here. Past meets present at Ebey’s Landing, which is the only national historical reserve within the National Parks system. Here, one of the earliest European settlements on Puget Sound is preserved with a partnership between various agencies, towns and landowners. According to the park brochure, “A Trust Board representing the Town of Coupeville, Island County, Washington State Parks, and the National Park Service manages the Reserve through creative conservation and planned development.” And while most of these entities hold some property, the majority of the property within the Reserve is still privately owned. The area is a working, changing community, but many areas of the Reserve are the same today as they were in the 1800s. Since much of the land is privately owned, visiting Ebey’s Landing is a bit difficult. There are a few state parks within the park borders, where you can hike, bike or enjoy the beach. The town of Coupeville has a historical museum if you want to learn more about the history here. 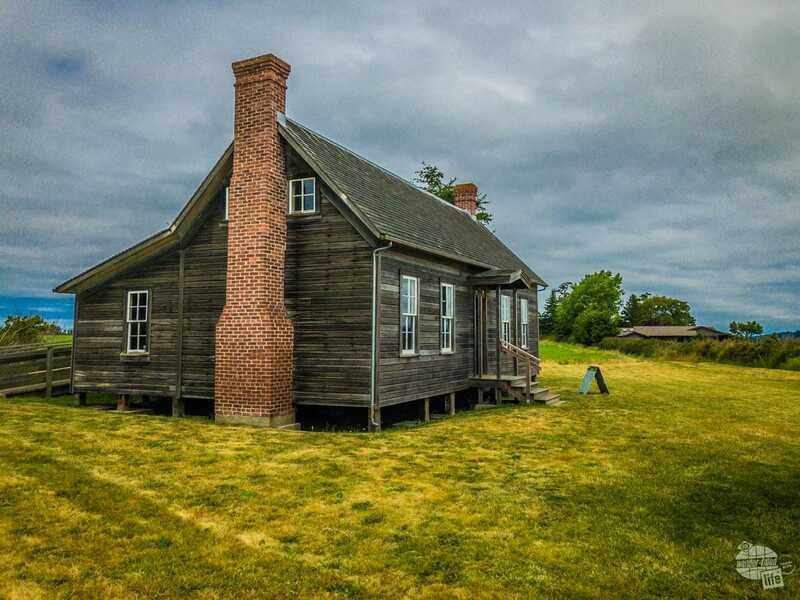 Our only real stop at Ebey’s Landing was the Ebey House. Unfortunately, volunteers staff the house only on weekends, during the busy season. The first permanent Euro-American settler on Whidbey Island was Isaac Ebey, who arrived in 1850. 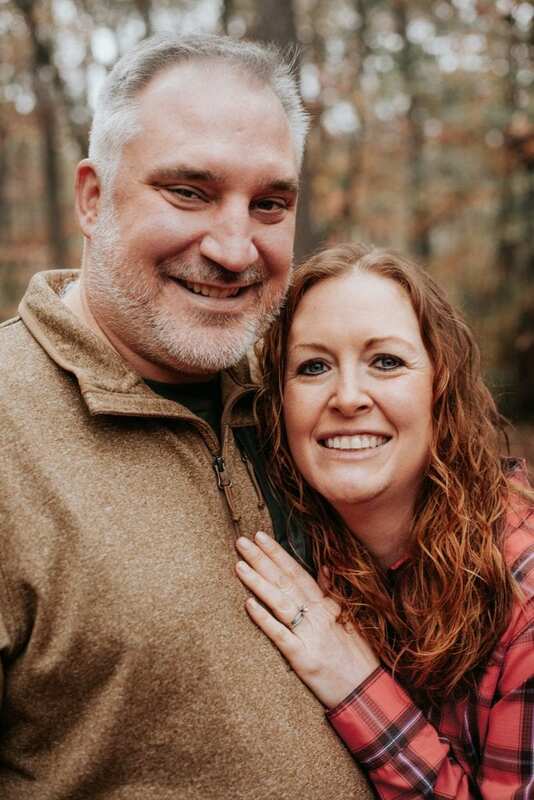 His wife, sons, parents and sons all joined him within a few years. This small 700 square foot house was home to eight people. 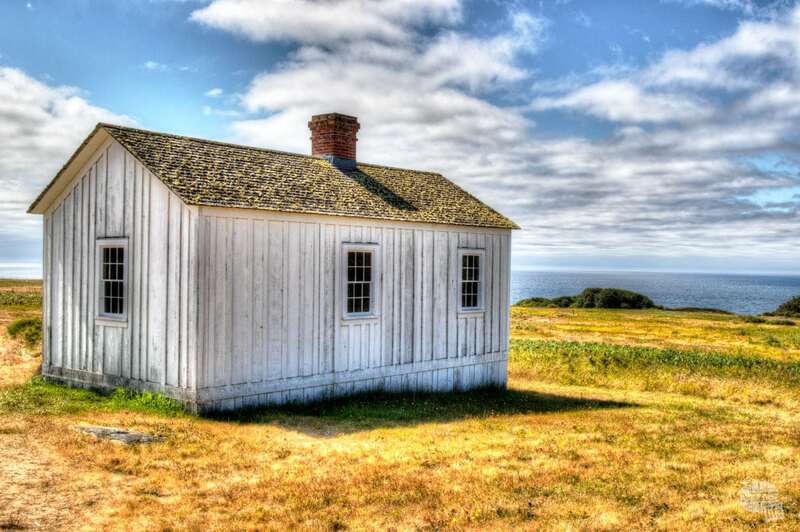 Along with the house, the Ebey’s had about 300 acres of land on which they raised wheat, oats, potatoes and chickens, pigs, horses and dairy cows. There is a trail from the house down to the coastline, but we decided to skip it since the weather wasn’t great. We thoroughly enjoyed San Juan Island and the national historical park. The park can be seen in a few hours, but the island is certainly worth at least a full day. 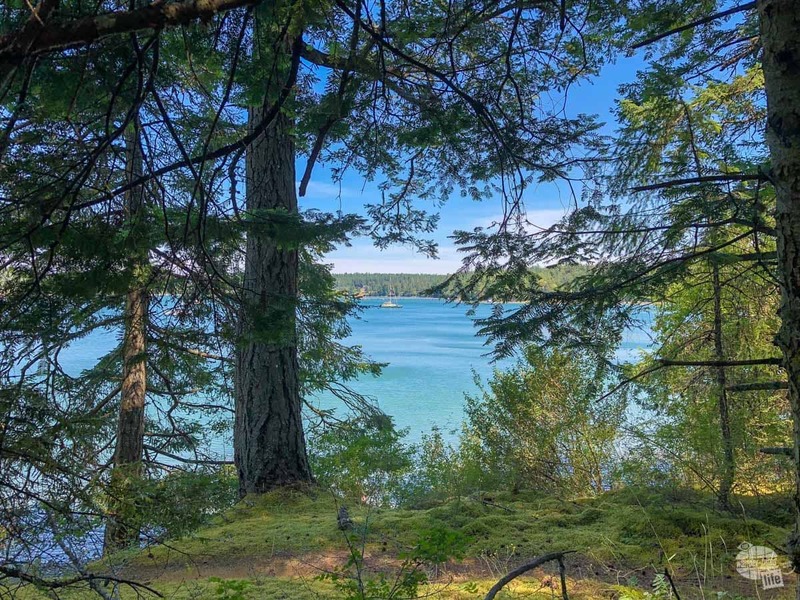 A long weekend on San Juan Island would be an enjoyable and relaxing escape from the “everyday grind” of the mainland. Whidbey Island is nice but did not have quite the same vacation feel as San Juan Island. I suspect it is more of a locals’ getaway. And while I appreciate Ebey’s Landing NHR, it is also a bit odd. If you have a particular interest in the area or, like us, want to visit every National Parks site it is worth an hour or two. Otherwise, you won’t miss much if you skip it.